I’m starting to feel like God’s trying to get my attention. Yup. I think He’s definitely trying to tell me it’s time to move on into new and better things. Ecclesiastes 3:1-8 is something I’ve read dozens of times. Right now, though, it feels even more meaningful than it has before. 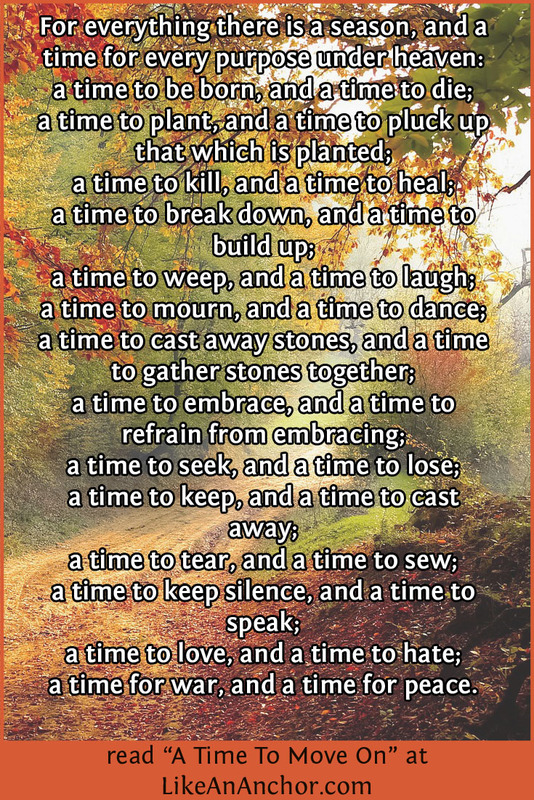 I love the concept of time as something that has an ebb and flow with changing, repeating seasons as we move forward. The times of weeping, mourning, casting away, losing, and tearing will give way to times of laughter, dancing, gathering together, seeking, and repairing torn things. There’s a time to learn from and grieve the past, and there’s a time to move on with your life. I’m not sure yet exactly what “moving on” will look like for me. Maybe it’s finally finishing the second edition of The INFJ Handbook. Maybe it’s going to grad school for a Master’s degree so I can teach. Maybe it’s being open to a new relationship rather than panicking and sabotaging things in an effort to avoid another heartbreak. Or maybe it’s all of the above. I guess we’ll see. How about you, my dear readers? Are any of you in a season that you’re ready (or maybe should be ready) to move on from? Perhaps we can do that together. ← Are You Growing Or Shrinking? Wonderful post Marissa. Many times in my life, I have told myself to, “do something about it, or get over it.” It is not quite the same a grieving a loss, but similar. Getting rid of the things that don’t serve us, but just crowd our minds. I have no doubt that good things are coming your way. Yes, I definitely have a new season to enter so it’s time to close up the old one. It makes me a bit nervous but I guess once I start moving forward I’ll adjust to it. I think it’s normal for change like that to make us nervous. The trick is to keep moving forward anyway and hold on to hope that it’ll all work out. Best of luck to you! It is always great connecting with you, Marissa. (Via your blog)We seem to have so much in common, dare I say it is uncanny 😄 Yoga with Adrien! She is the best! Haha anyways, I enjoyed your valuable infj insights regarding this “moving on” topic. Sometimes I feel like, the idea life, the thought life is so easy and clear, but the practice part eludes me! I wish you luck on your journey, as I too keep moving, keep trying, and looking to Yahweh.